May. 22, 2017 2:15 p.m.
With controversy swirling around the fallout from U.S. President Donald Trump’s decision to fire his FBI director, a Saanich woman’s fresh take on the situation has put her in the international spotlight. 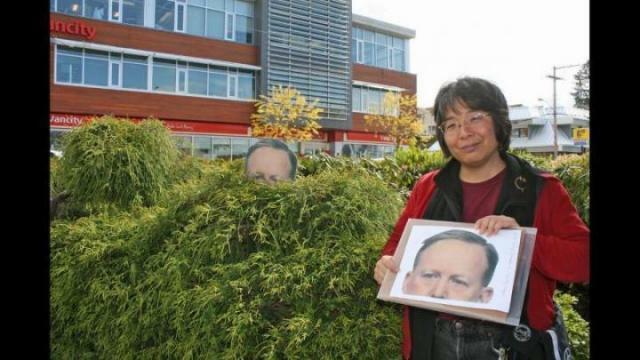 On May 11 Saanich resident Lisa Kadonaga shared a do-it-yourself cut and paste ornament she dubbed (and hash tagged) the Garden Spicer. By May 12, she was receiving messages from friends regarding how fast the meme was being shared on the internet. It came from the fallout of White House press secretary Sean Spicer infamously hiding ‘among the bushes’ last week in order to delay an on-camera appearance explaining Trump’s abrupt termination of James Comey as head of the FBI. The next morning she received a message form a friend who said they saw the Garden Spicer on Twitter. The post soon had 110,000 shares, with outlets such as the L.A. Times reporting a Garden Spicer on Santa Monica Boulevard and Facebook shares showing the cutout peering from the shrubs of a North Carolina road. Over the weekend they turned up in gardens, traffic meridians and even in Mother’s Day bouquets. By Thursday the link to the Spicer image online had frozen (or was temporarily suspended, she figured). By Monday Kadonaga was fielding calls from major Canadian television, radio and online media agencies and the story showed up in dozens of publications online and in print, making its way all the way to the Washington Post by Tuesday. “I figured it’s Victoria, people like gardening, but I didn’t think the people who liked crafts, gardening and politics were that numerous,” Kadonaga said. Kadonaga believes the reason it caught on so well is also because the photo, by Getty Images photographer Chip Somodevilla, captures some sincerity in Spicer’s eyes. “I think there’s this seed of sympathy for Spicer,” Kadonaga said. “Other people [are put in a tough spot and] have had to do a job without the information or tools they need, and they tried anyways because it’s their job. Evidently, the photographer Somodevilla got a kick out of it too as he retweeted it on Friday.